There were many design movements happening at the same time in the early 20th century. It is no wonder that a lot of the Architecture built during this time was a combination of building styles. When referring to these periods I am talking about the persistence of Architecture and furnishing for these architectural styles, not necessary the Chronology of the period. The late Victorian period was ending and the Arts and Crafts Movement was in full swing. Art Nouveau came later in the US than in Europe so there were still ideas from this design period that persisted. The Art Deco period and that dawn of the modern was just beginning and there has been a persistence of Colonial Revival in the US ever since the establishment of our Government. I mention all this because it can be a challenge for a home owner to be true to the Architectural style of the building they own in which they feel Stewards of their property in addition to owners. In addition to the Hybridization of building styles there is the individual renovations that have gone on due to upgrades and modernization of the interiors. This can be a trendy kind of development that may last for 10 years and a new owner may be tasked with the job of changing or at least modifying what has been done by the previous owners. There is always the question of what do I get rid of and what do leave and try to work with. This brings up the query of how do you integrate new design elements ( specifically lighting) into Architecture and rooms that have collected design elements that are going to stay. This query is more complicated or variegated than it seems on the surface. I believe this notion is responsible for a lot of current trends we are experiencing in building renovation at this time. When I first started out selling restored Antique Lighting the trend was to make the building and the interiors look like they did 100 years previous. To recreate the period that the house was built. This approach still exists but a lot of new owners come to a purchased building with more of a need to put a personal stamp on the renovated design. For sure what we are seeing is a less “purist” approach to the development of a living space. This approach definitely uses the creative skills of Design Professionals. 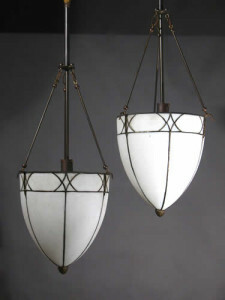 We are still selling Antique lighting but it has moved from the purist’s interest to the interest of the design professional trying to find something unique or unusual for the house. I think they believe if they can be true to the period of the house and put back something from the period, they will try to do that. But Contemporary comfortable furniture and ultra modern appliances and interesting Art Works are details that these unusual Antique Lighting pieces have to be able to work with. So this brings us back to the question how do you integrate Antique lighting into an environment with already collected design elements? Definitely something more minimal is being asked for. We have found that integrating Arts and Crafts Inverted Domes into these cross pollinated Architectural designs has worked in many cases. They are Architectural in design and the minimal parallel and intersecting lines in leaded glass are like a line drawing.